Lighthouses of Caloundra | Lighthouses of Australia Inc.
After the 2018 AGM members of LoA visited the two Lighthouses of Caloundra on the Sunshine Coast. We were welcomed by members of the Friends of Caloundra Lighthouses, a group of friendly, dedicated volunteers who guide interested people through the lighthouses on the 2nd and 4th Saturday of every month. 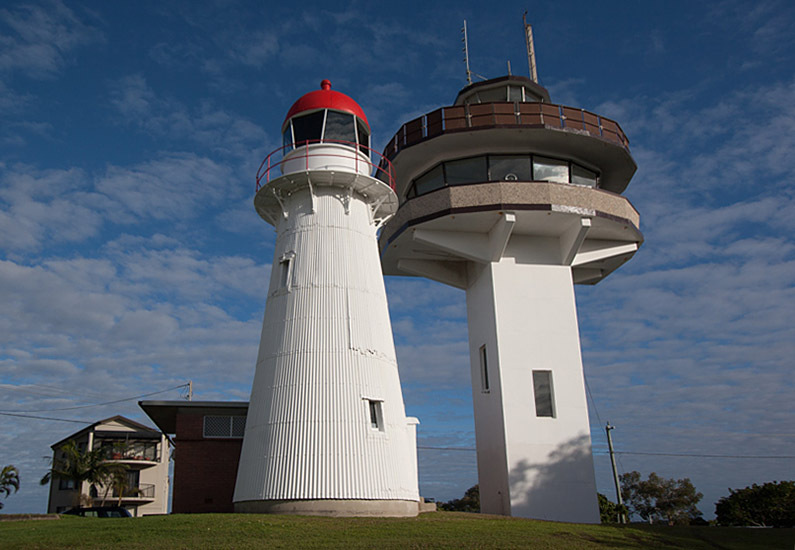 The Caloundra Lighthouses, constructed in 1896 & 1968 respectively, provide a rare opportunity for comparising and demonstrate the evolution in marine navigation along the Queensland Coast over 100 years. The Old Caloundra Head Lighthouse remains the oldest building in Caloundra Township, construction started in March 1896 it was officially lit in September 1896. The forth order Chance Bros dioptic apparatus was imported from Birmingham, England. The 11.6 metre high tower has a tapered hardwood timber frame and corrugated galvanised iron sheeting, it is a unique Queensland ‘timber & tin’ construction. The light was originally a wick burning oil lamp but was replaced in 1910 with a Chance Bros incandescent vapour kerosene lamp, the first of its type in Queensland. It was converted to automatic electric operation in 1942. The original lighthouse was attended by a single keeper. The New Caloundra Lighthouse. With the advent of larger ships, Moreton Bay’s deep water channel became more important. This justified the construction of a new lighthouse, a modern tower comprising a lighthouse, a signal station and a radar station. The concrete lighthouse was build just metres from the old lighthouse. It became fully operational in 1968. A light array using a stack of sealed beams was installed, the signal station was manned continuously. The purpose was to monitor shipping entering Moreton Bay. It marked the entrance to the channel for only a decade because it was progressively blocked by high-rise apartment buildings being erected on the headland which blocked views of the light from sea, The light was downgraded and eventually extinguished in 1992. A new lighthouse was constructed in 1978 at Point Cartwright near Mooloolaba, it is a pentagonal concrete tower with a precast concrete lantern room. The two Caloundra Lighthouses stood side by side for only 3 years until, on thread of demolition, the old lighthouse was relocated to Golden Beach by the Caloundra Power Boat Club in 1970. After many years of disrepair, neglect and the subsequent deactivation of the new lighthouse, the old lighthouse was returned to the headland and restored in 1999 reuniting the two lighthouses. With thanks to the dedicated members of Friends of the Caloundra Lighthouses.